1. Open up Gimp, then FILE>OPEN AS LAYERS frame 3 from the kit. Right click and scale to 546x540. Add drop shadow by going to FILTERS>LIGHT&SHADOW>DROP SHADOW and set the levels at 0/0/15. 2. Open as layers paper 6 from kit. Scale to 500x500 and put it behind the frame by clicking and holding down on the mouse then dragging it below the frame in the layers box. Right click on this layer and select ADD ALPHA CHANNEL. 3. Open as layers element 6 from kit and scale to 208x199 then add a drop shadow with levels at -1/1/2. 4. Open as layers element 4 from scrapkit and also add a drop shadow with levels as written in step 3. 5. Open as layers element 8 from kit and scale to 136x255, also adding the same drop shadow as written in last two steps. element 10 just scale down so it looks like it will fit in the bucket. Then right click on the bucket (element 11) and choose ALPHA TO SELECTION. Now, click back on element 10 layer so it is active. Zoom in so you can see what you're doing lol... VIEW>ZOOM 1:1 or 100% then click on the eraser tool and very carefully erase whatever part of element 10 that is in the bucket. SELECT>NONE then add drop shadow at 2/2/2. 7. Add element 16 and 31 from kit. Scale 16 to 78x241 and element 31 to 134x87. Add drop shadows to each with settings at -2/2/2. 8. Add your tube of choice. Add drop shadow to this as well. DO NOT FORGET TO LEAVE THE COPYRIGHT INFO. 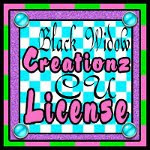 Copyright symbol, artist's name and website, also license number- if applicable- must be clearly legible. 9. Open as layers both elements 12 and 14 and scale both down to 99x100. Then duplicate both layers and arrange in a row, alternating colors. 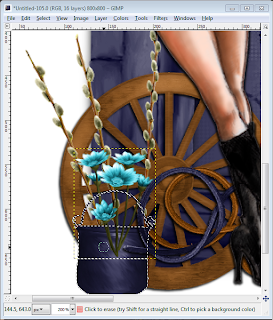 Use the rotate tool to adjust how they look until it seems right to you then merge all the 4 layers (blue flowers) together by right clicking and choosing merge down. You can then duplicate this layer and again arrange as a row. Merge again. Now, you want to duplicate and go up to LAYER>TRANSFORM>ROTATE 90 degrees clockwise. Put this at the top, then duplicate and rotate 90 degrees clockwise again for the left side. Use the eraser tool if any sticks out too far. 10. Open as layers element 15 and do pretty much the same thing you've done in the last step- but this is going on all 4 sides... this will be at the very back of the tag, at the bottom of the layer box. 11. Add the text- I used a font called NASHVILLE. I typed out my text, right clicked- ALPHA TO SELECTION, added a new layer used the colors I wanted and used the BLEND TOOL to this new layer. Just click and drag up then release. It takes a bit of practice but you can get it! Add noise by going to FILTERS>NOISE>RGB NOISE with settings at 20/20/20/0. Then SELECT>GROW by 2, add new layer, fill with darker shade, SELECT>NONE. Add drop shadow and you're done! 12. Save your tag as .xcf first so you can come in and make changes later on down the road if need be. When you're ready to head on down the trail then save as .png to have a transparent background and everything as a flat layer. Thanks for viewing this tutorial!